Nitin Tomar won the Super Raider of the match with 20 points. Dabang Delhi put on a fine all-round performance to win against the Puneri Paltan 41-37. 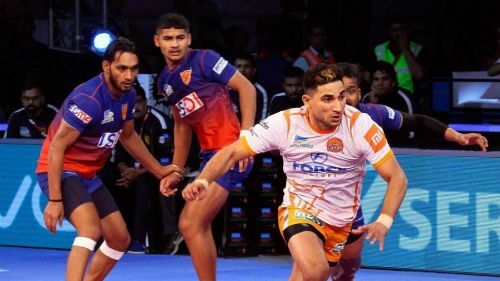 In a match which played out as a competition between Nitin Tomar and the entire Dabang Delhi, the Dabangs with their coordinated efforts pipped Tomar to the win. Nitin Tomar, in a splendid display of his raiding abilities, scored an astounding 20 points from his 23 attempted raids. He fought on even when the other raiders failed miserably. Deepak Kumar Dahiya could just manage 2 points, while G.B.More could manage 3 points. The substitute raiders, Akshay Jadhav, Amit Kumar, and Rajesh Mondal failed to feature on the scoring board. The defence too failed to lift the team's performance, as Girish Ernak and Sandeep Narwal were the only ones to attempt successful tackles earning them 4 points each. The other defenders, Ravi Kumar, and Vinod Kumar failed to score even a single point in the match. 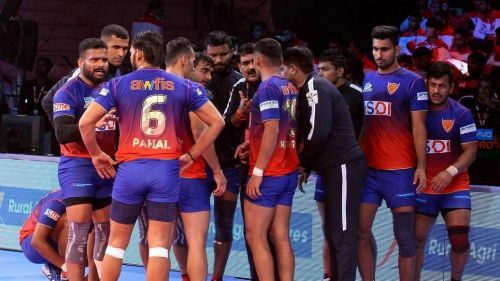 These sporadic, individual performances of the attack and the defence should be turned into a more consistent team effort if reaching the knockout stage figure in the Puneri Paltan's plans. The Dabangs played well as a single unit. Dabang Delhi, on the other hand, were a prime example of how important a team effort is to win matches in a sport like Kabaddi. While none of the players could score more than 10 points, there were 4 Delhi players who managed to score equal to or more than 5 points. Naveen Kumar (7 points), Pawan Kumar Kadian (7 points), and Chandran Ranjith (6 points) were the prime contributors to Dabang Delhi's 23 raid points. While all the four primary defenders - Vishal Mane, Ravinder Pahal, Joginder Narwal, and Viraj Vishnu contributed to the Dabang's tackle points. Vishal Mane emerged the best defender for the Dabangs with 5 tackle points. The only change that Dabang Delhi may need in their next match is to give Pawan Kumar Kadian a start ahead of Meraj Sheyk. Puneri Paltan next takes on the home side, Haryana Steelers, on Sunday the 14th, whereas Dabang Delhi, after a short break, will play against the Steelers on the 18th of October.